You can add resistance bands to the workout, if your machine is set up for it. As a piece of fitness equipment, the mini stepper takes up relatively little room and is relatively inexpensive. Both features may make it suitable for those who want a home gym, but have limited space and money. The equipment typically consists of two foot pedals and a metal base, and some feature a pole or other handle to hold onto during the exercise. Some models also come with a set of resistance bands that allow you to tone the arms. By moving the equipment up and down with your feet, you can replicate the motion of climbing stairs. The mini stepper can provide a cardiovascular workout and strengthen some of the leg muscles. 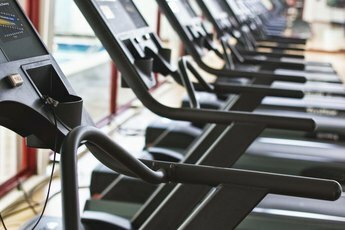 Before you start your workout, make sure the mini stepper is set up properly. Place the stepper onto a flat surface. If the stepper's display box has a power button, press it to turn it on. In some cases, the display may illuminate when you step onto the stepper and start stepping. Some models may ask you to enter your weight to properly calibrate intensity and other features. If this is the case, you will be prompted to enter your weight. Other models allow you to choose what to display on the screen, and those choices may include steps taken, calories burned or time elapsed. Depending on the model, you should be able to toggle between these display modes by pressing the "Mode" button or a similar button. Before you start your cardiovascular workout on the mini stepper machine, make sure you perform a proper warm-up to get your blood flowing and your muscles prepared for the exercise ahead. Walk in place or around the block for five to 10 minutes until you break a light sweat. Following that, you can also do stationary or dynamic stretches to warm up. Dynamic stretches include swinging your legs from front to back and performing arm circles. If your mini stepper has hand grips, grasp the hand grips, then step onto the machine with one foot on each foot pedal. Allow your arms to be somewhat loose so you can focus primarily on the movement of your legs. Step downward with one foot, which should cause the other foot pedal to rise at the same time. When you reach the crest of the movement with the top foot, promptly press down with that foot and allow the other foot to rise. Start out slowly, then increase your speed as you get more comfortable with the movement to achieve an effective aerobic workout. The Centers for Disease Control and Prevention provides guidelines for the amount of physical activity adults should have each week, and one recommended routine is to do at least 150 minutes of moderate-intensity aerobic activity each week along muscle-strengthening activities at least two days a week. Before you start training with a mini stepper, consult with your doctor to ensure you can perform this exercise safely. Different mini stepper models have different methods to increase the intensity of your workout, but they typically have some type of dial that will allow you to increase the resistance of the step, making it more difficult to push the pedals. On some models, the tension dial is located between the two steps, at the front of the machine. 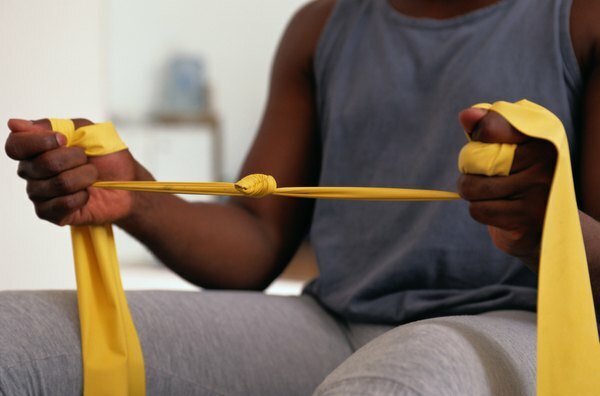 You may also be able to incorporate resistance bands to the steps to allow you to move your arms with the stepping motion. Consult your user's guide for information on attaching these bands to your machine.